“Snap away. Just use a little old-school sense when choosing who to fix it,” an Augusta, Ga., TV news report advises viewers in a recent look at insurers’ consumer-facing photo estimating options. That breezy assessment by WRDW “On Your Side” investigative reporter Liz Owens concludes a broadcast and Thursday article in which a collision repairer and mechanic warn that photos of the vehicle exterior might not show interior damage. “Nine times out of 10, it’s not gonna cover all the damages,” Kendrick Paint and Body owner Steve Kendrick told WRDW. C&C Automotive President Aaron Clements Aaron Clements, a mechanical repairer, said a body shop might repair visible issues and those on the estimate, but “they may not necessarily repair things that are behind the scenes,” according to WRDW. The oil pan or transmission pan might be cracked, he told the station. Kendrick said photo estimates do get the process started, and Owens describes them as producing a check to the body shop. This isn’t entirely accurate. Allstate, for example, describes sending payment directly to the customer with Quick Foto Claim. This does reflect the true relationship in insurance-reimbursed collision repair: The customer, not the insurer, is the shop’s customer and is the party that actually owes the shop for the repair. The insurer owes the customer reimbursement under the terms of their separate contract with the policyholder. In some cases, this two-step process can be simplified to a single step where the insurer just pays the body shop, but it doesn’t actually alter the two separate business relationships. 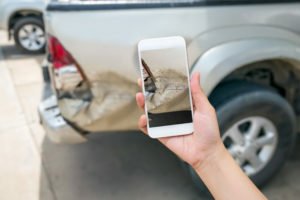 The distinction glossed over by the broadcast is important, as some collision repairers argue customers will just “cash out” with the initial insurer payout rather than have the car fixed — unaware internal damage remains. As Clements told WRDW, if the body shop misses the damage and the customer doesn’t find it for “years to come,” he or she might have to “foot the bill” for a repair that was related to the covered loss. The customer cash-out issue didn’t make the broadcast. However, the show does touch on the other concern with photo estimating: A shop that fails to catch the internal problems. The show didn’t get into the reason why a shop would miss them, but there’s two scenarios that seem likely. A shop performs a teardown to check for hidden damage not reflected in the internal estimate. However, through inexperience, incompetence, laziness, or just having an off day, a technician fails to catch internal damage. This is concerning, but the more alarming scenario seems to be a situation in which the repairer fails to look or repair deeper than the initial insurer estimate. Potential reasons for this omission might include laziness, misunderstanding of the claims process (“the insurer is my customer, and this is what they want done”), or an eye toward DRP severity and supplement metrics. The news segment advises viewers that photo estimating can get the claim process going but tells them to pick a quality repairer. “It’s bad if you choose a body shop that doesn’t catch hidden problems,” Owens tells viewers.